We'll do our best to respond promptly. Z820 F1K15UT $9,999 - one of the two highest performance Z820 configurations available: 24 total physical cores (48 with hyper-threading). Note: HP "Smartbuys" (HP's "pre-configured" or "quick-ship" models) are often available at a discount vs. CTO ("Configure To Order") models, and ship faster. Smartbuy models and configurations do change time to time: check to see if it's available from HP before making a purchase decision. Site preparation guide: HP Z800 Workstation 1110W power supply, HP Z820 Workstation 1125W power supply (PDF): Power consumption and cooling considerations, limitations, Input current calculation, Power dissipation. Intel® Xeon® processor E5-2687W is only available in dual processor configurations with Liquid Cooling and with the 1125W Power Supply. E5-2687W v2 however does not require liquid cooling and is available in single CPU configurations. Optional 1125W Power Supply is required with most high power CPUs and graphics card configurations. - SAS 6Gbs - 8 ports. 1. Not all 3rd party SSDs are compatible with HP Z820. Customers attempting to install 3rd party SSDs have encountered compatibility problems. Those problems may have been fixed with Z820 BIOS versions 1.08 or higher. It's still recommended to extensively test 6G SSDs before using them in production environment. 2. HP SSDs may not be the optimum choice for high performance configurations. For instance, HP 300GB SSD LZ069AT commonly offered with HP Z800 and Z820, is an Intel X25-M SATA 3G that is much slower than Intel's more current 330 and 520 series SSDs, and doesn't take advantage of Z820's 6G SATA speeds. That said, we tested Samsung 840 Pro and Intel 520 series on SAS and SATA 6G ports, and are offering them on select Z820 configurations. 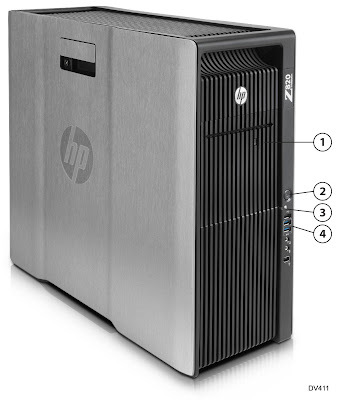 Some HP servers (that are actually smaller than an HP Z820) can fit up to 16 (yes, sixteen) SFF drives. ...that fits in an optical 5.25" bays. That's a total of ten (eight if there's a DVD drive), while the Z820 has fourteen SAS/SATA ports. You can see where we're going with this. Why SFF (Small Form Factor) drives? For one, they're the present and immediate future of storage. SSDs are mostly SFF or smaller. SFF drives benefit from less vibration and can be made to higher tolerances. More SFF drives can fit in the same space which means higher speeds when you stripe them, which in turn means you may not need a heavy, bulky, expensive external SAS expander box to house a bunch of drives for those uncompressed 4K workflows. Enter HP 4-in-1 SFF (2.5in) HDD Carrier (P/N B8K60AA) retailing for $139 and what really is Icy Dock MB994SP-4S. Says so on the label. This metal device lets you use four SAS or SATA spinning or SSD drives, has two fans and four SAS ports in the back, a single Molex 4-pin power connector. Two of those, and you can have a total of 12 drives in a Z820. The device isn't quite server grade: sub par quality, no hot-swap support. Unlike this unit, HP server backplanes' LEDs can indicate drive fault, and RAID set selection besides activity. This unit's activity lights are tiny, hard to see, and in my experience, don't always work. We've asked HP to come up with server-grade backplanes for the workstations and still hoping it might happen. Meanwhile, this device is the best option to house a number of SSDs or SFF spinning drives - including 16mm high SAS ones - in a Z820 - or any other system with a spare optical bay and SATA or SAS ports.